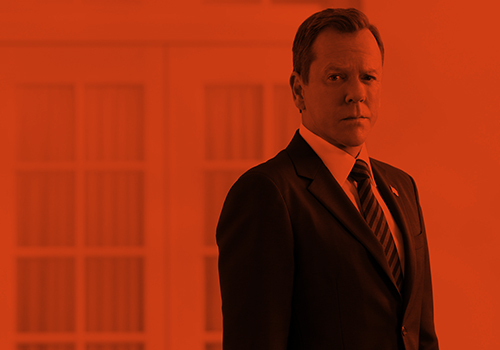 KIEFER Sutherland missed his ’24’ “family” while the show was off air. The 47-year-old actor is back as fugitive ex-Counter Terrorist Agent Jack Bauer in new FOX series ’24: Live Another Day’ and he admits when the show ended in 2010 after eight seasons he found it hard to know he wouldn’t get to see the friends he had made working on the program. Speaking at a special screening of the first episode at Old Billingsgate Market in London on Tuesday night (07.05.14), Kiefer said: “I was fine putting the character to bed but we had worked with the crew for eight years, 98 percent of those people were there from day one to the very end. I think over the course of the eight years 32 children were born and 42 marriages happened. I know it sounds trite but we were a family. Kiefer admits he was as surprised as anyone when he was told by lead writer Howard Gordon that ’24’ was coming back. The action hero was initially worried the new series wouldn’t be able to match the show’s high standards but he thinks the London-based adventure about a plot to assassinate the US President is the best series ever. This entry was posted by Courtney on Friday, May 9th, 2014 at 6:43 pm. It is filed under 24, 24: Live Another Day. You can follow any responses to this entry through the Comments Feed.